Transform a few sheets of colored tissue paper into a pretty bouquet of paper flowers for Valentine’s Day, then personalize the bouquet with a heart-shaped potpourri and eyelet lace plant poke. This Valentine craft is very versatile – you choose whether to make the bouquet entirely of realistic paper carnations, or to add in some tissue paper roses and the plant poke, or another addition of your choosing, as well. 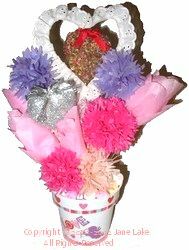 Here, we present the bouquet in a white plastic plant pot decorated simply with Valentine stickers and filled with candy hearts. However, a glass vase, ivy bowl or fluted wine glass might work better for the creation that you have in mind. Don’t be afraid to experiment or to add your own creative touches – anything that comes straight from your heart will surely be welcomed on Valentine’s Day! For this project, we made three inch paper carnations, but you can easily make four inch or five inch versions of this flower – just adjust the measurements given in the example pattern shown at right. Each carnation is constructed by gluing together successive layers of the same sized tissue paper pattern. For three inch carnations: Stack together six three inch squares. For four inch carnations: Stack together eight four inch squares. For five inch carnations: Stack together ten five inch squares. Fold the stacked squares in half, then draw the pattern shown in our template on the top sheet. Cut out the pattern through all layers. First, cut along the outer edges and dotted lines, then snip triangular serrations along each petal edge, as indicated in our template. Take a green chenille stem and fold over a small hook at the top. Dress the hook by gluing over it a small snip of tissue paper in the same color as the flower you are making. Pierce the center of the first tissue pattern and slid it up toward the covered top hook. Apply small dots of glue at the bottom of the hook then press the tissue paper pattern into place, in a trumpet shape. Repeat for each layer of tissue. For the inner petals, cut a piece of tissue paper 20 inches long by 3 inches high; for outer petals cut a 20 inch by 4 inch rectangle. Fold both strips into eighths, then cut out a petal shape by curving both upper corners, as shown in our paper rose template. Glue one end of the inner petal pattern to the stem, directly below the hook. Begin rolling the petals tightly around the stem, pinching, gathering and gluing in place as you go. Roll, gather and glue the outer petals in the same way. Insert the top of a bamboo skewer firmly into the bottom of a styrofoam heart. Brush the styrofoam with tacky glue and roll in fine rose petal potpourri to cover completely. Let dry. Form craft wire into a heart shape that outlines the styrofoam heart. Thread eyelet lace onto the wire, pushing the wire through the lace hem casing. Twist the ends of the wire together to fasten, then overlap and glue together the ends of the lace. Place the wire and lace heart over the styrofoam potpourri heart and glue in place where the lace meets the bamboo skewer stem. Cut and fit a small piece of florist’s foam, placing it in the bottom of a 4″ plastic pot. Insert stems of paper flowers and plant poke. Top with Valentine candy hearts or chocolate kisses.